Those who have read the previous two blog entries about my USA trip (if you didn’t, feel free to give them a read over here and over here) might have noticed that they convey a feeling of excitement, gratitude, thrill, happiness and adventure. This is not by accident since the two weeks spent in Northern California and Oregon certainly had this “once in a lifetime” feel to them. The last week was destined to even outdo the previous experiences – the exhilarating Gifford Pinchot National Forest with Mt. St. Helens and Mt. Adams, Mt. Rainier and not to forget the Olympic Coast, Rainforest and Mountains. Yet, my memory of Washington is bittersweet. It was not the fault of the landscape, the weather or even the people – all of them were beyond wonderful. In the end it was my fault. A split-second of inattentiveness. But more on that later. How could you be inattentive in moments like this? Read on for my story behind this photo. Entering Washington State via the Bridge of the Gods over the Columbia River in Cascade Locks, our little party could not be more excited. A whirlwind of places and adventures in Oregon lay behind us and the agenda for the coming days was certainly not less promising. We set up camp right behind the state border near the mouth of the Wind River into the Columbia. 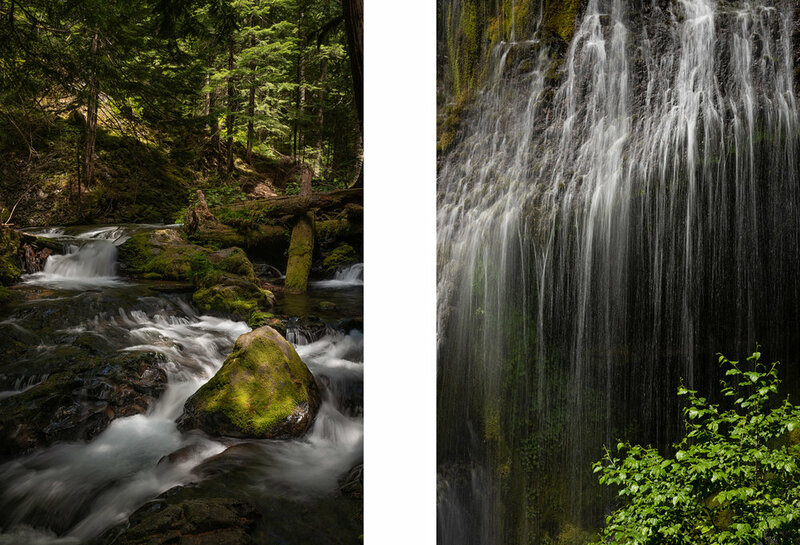 The next morning the Wind River Highway led us deep into the Gifford Pinchot National Forest. This region can be considered quintessential Pacific Northwest (only a stretch of coast is missing): It his heavily forested, mostly wet, features hilly to mountainous terrain with countless streams, cascades and waterfalls, boasts two giant volcanoes which dominate the landscape within hundreds of square miles, and last but not least is distinctively wild with its eight wilderness areas (among them the famous Goats Rock Wilderness). Thousands of leaves, hundreds of branches, dozens of trees all form a vortex that I cannot resist staring into. Do you also wonder what lies beyond the visible layers? This sense of mystery is definitely one of the many reasons why I love forests more than any other ecosystem on the planet. Panther Creek a few meters before the falls and a detail of the fan-like section of the cascade - both featuring various degrees of direct sunlight for the enjoyment of the photographer. Waterfalls, mountains and forest quickly became routine on the PNW trip for all of us, so in the spirit of “new horizons” we had to come up with something new every now and then. The next stop on our itinerary was THE chance for eye-opening experiences. Mt. 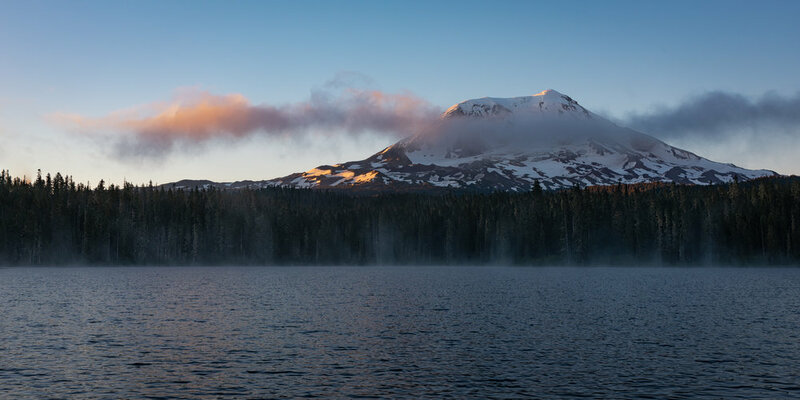 St. Helens has been a sleeping giant like many of the volcanoes of the Cascades until the spring of 1980 when a series of earthquakes and steam eruptions heralded a big event. On May 18 it came. The entire north flank of the mountain collapsed and a fatal pyroclastic flow, a mix of gas and volcanic matter, quickly flowed into the immediate vicinity of the volcano burying everything from trees to streams. 57 people were killed as an immediate effect of the eruptions. There are circles of life everywhere in the wilderness. 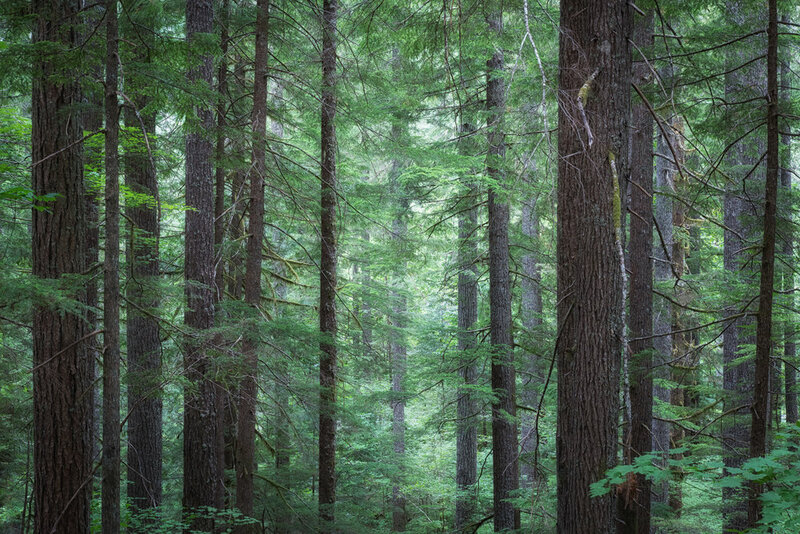 This is a section of the old-growth forest that has been designated Columbia National Forest by Theodore Roosevelt in 1908, renamed after the first director of the National Forest Service, Gifford Pinchot, in 1949 and included in the Mt. St. Helens National Volcanic Monument in 1982. Coming from southern Washington we chose two places on the southern flanks of the volcano for our first encounter. Ape cave is a so called lava tube, a volcanic oddity with high entertainment factor. Its formation is unrelated to the 1980 eruption, it’s dating back to a lava flow approximately 2000 years ago. Hot lava flowed through a river bed and as the edges cooled (bottom, sides and top!) the center of the flow was insulated and stayed fluid for a long time. When the influx of lava ceased the matter flowed out the bed leaving behind a hollow tube more than two miles long. With its diameter between three and six meters it’s a perfect hiking tunnel and we could not let this opportunity pass. The fun part is that the tube is not illuminated at all and you’re relying on your own headlights or torches. This made photography a little tricky, but I managed to snap a few photos here and there. 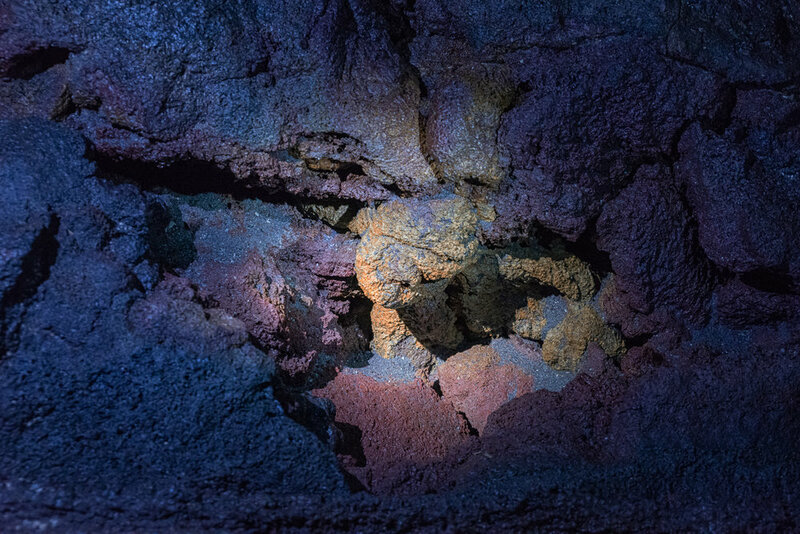 There are some alien worlds down below … or at least some quirky shapes and colors in a lava tube! Following the road (one of three that penetrated the Volcanic Monument) further north, we reached the Lava Canyon Trail. Again dating back to earlier eruptions this part of the Monument showcases volcanic rock eroded by a stream, Muddy Creek. The result is a small gorge with a series of rapids and falls surrounded by wonderful forest. The trail follows the northern and southern rims of the gorge connected by a charming suspension bridge (another new thing on the trip!) and proved to be perfect for hiking with two active kids. 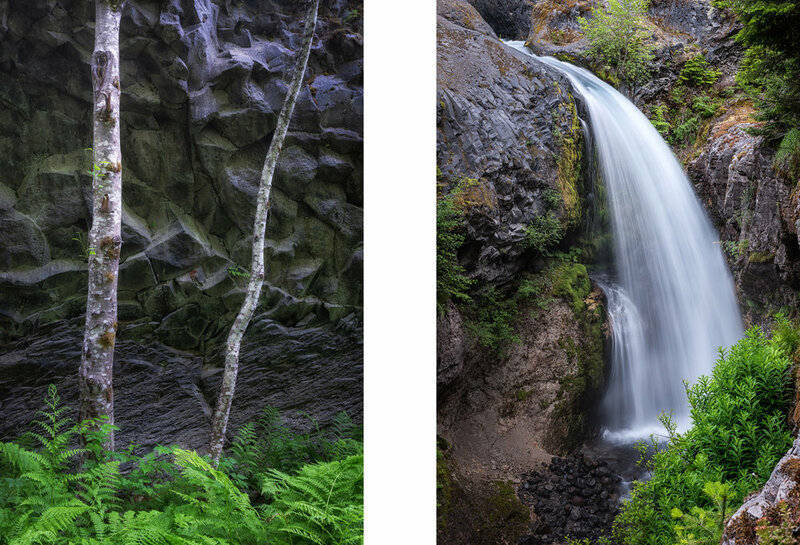 Photographically the juxtaposition of the dark magmatic rock with the water and the lush vegetation was a pure joy, so even while trying to prevent the kids of falling into the gorge I managed to create a few photos that I really like. I take it as another prove that exploring new horizons can greatly stimulate creative processes – while I am not denying the fact that intimate knowledge of an area through repeated visitation can do the same thing. Volcanic rock is the common denominator in the landscape around Mt. St. Helens. I absolutely adored the way the virgin ferns, trees and water stood out agains the rock. I had booked a campsite for the night in advance so we faced another drive this evening, leading us east from Mt. St. Helens towards the Mt. Adams Wilderness in the Gifford Pinchot National Forest. The road (NF88xx) seemed to be a normal road according to Google Maps but proved to be an adventure in its own right. Allowing only for going at a crawl in some sections I walked in front of the vehicle with my torch making sure that it does not get stuck in the caldera-like mud holes or damaged by the impressive boulders on the “road”. I was so happy when we finally reached Takhlakh Lake Campground by nightfall and found our reserved site in the dark. Setting the alarm to 4:30 in the morning I was eagerly anticipating one of the most stunning views of the entire trip for sunrise. In the first glimpses of dawn light I make my way down to the shore of the lake the next morning. The reason why it’s to photogenic is impossible to miss: About ten miles southeast of the circular lake thrones another volcanic giant of the Cascades, Mt. Adams. Surrounded by nothing but true wilderness the mountain dominates the region just like Mt. Shasta in California, Mt. Hood in Oregon or Mt. Rainier further north in Washington. During sunrise the light caresses the colossal volcano either from the side (in summer) or from the back (in winter). Featuring an entirely unspoiled shoreline, Takhlakh Lake is the ideal place to picture Mt. Adams. So I began my work. After roughly an hour of shooting, the sun was getting too intense and I deemed my session complete. Having spotted a nice arrangement of boulders in the water, I decided to give one last composition a chance. I grabbed by tripod, moved two feet onto the shore and placed it on its new position. In a fraction of a second I made the decision to hop on another boulder for better viewing and handling, so I turned my back on the tripod and quickly stepped over. Turning back, my blood started to freeze. I could only catch the last glimpses of my tripod falling over and being submerged by the water. Needless to say I did not unmount my D810 for this procedure – I did not even switch it off. Uttering all kinds of unfriendly words I jumped into the water and pulled everything up. Water dripped out of my equipment, my eyes and my heart! So finally, it has happened to me. From there on the trip was not the same anymore. With the compassionate help of my family I tried everything to dry the equipment over the coming days. This was quite successful, more and more functionalities started to come back. Screen, dials, buttons, even autofocus and electronic communication with lenses worked again. Lucky me, you might think, but one tiny yet essential detail refused to operate: the card slot. No SD or CF card was accepted and therefor I could not save any of the photos I was again able to take. So I used my spare body for the last days, you might assume. Good one! I learned the hard way that traveling with a spare body is a good strategy. I did not own or carry one – probably for the last time in my life. So here is, may it rest in peace, the very last exposure I made with my D810. The top contender of the list of places my D810 had to see before it died. So hey, I’ve only got Mt. Rainier and the Olympics left on my itinerary, so no reason to worry and just enjoy the scenery? Well, actually that’s exactly what I tried to do and it worked mostly fine. Surprisingly fine, for a number of reasons: First, we encountered our first period of “bad” weather in Mt. Rainier National Park. Apart from spotting mighty Tahoma from 50 miles away we were not able to see the mountain during our three days in the park. It was cloudy, windy and drizzly. We even had to abort a hike into the Tatoosh Range due to massive remains of snow on the mountains. Not being able to photograph did not hurt that much. Narada Falls was an exception, because this is a really beautiful waterfall and the grey conditions could have worked quite well in the scene. 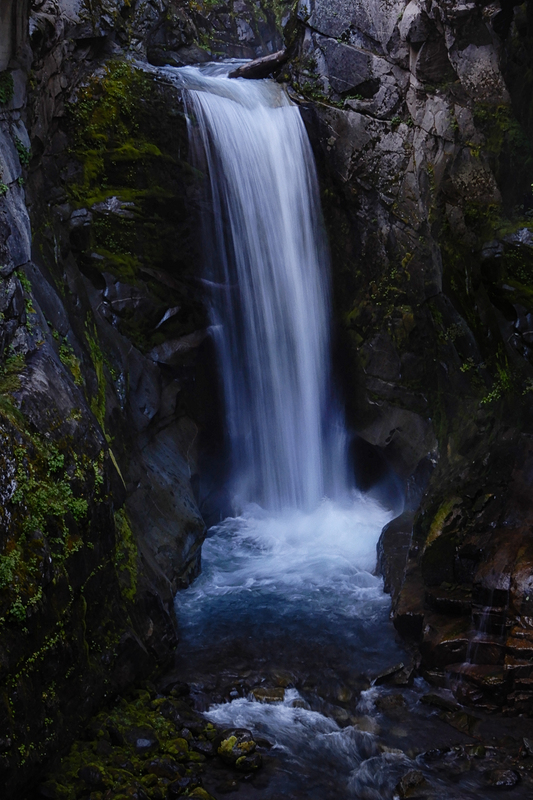 I took a few photos from Narada Falls and Christine Falls with the small Nikon point-and-shoot that my father-in-law brought with him. No raw, creepy autofocus and hellish noise, but still preserves precious memories. Undeniably nice light and textures at Christine Falls, Mt. Rainier National Park. But don’t force me to zoom into this photo taken by a 15 year old consumer point-and-shoot. With this being the second, the third reason that I was not too bad without my gear is that I did not have to continue to balance two pressures. Creating good photographs and simultaneously having a great time with the family on vacation is certainly possible, but a challenge. So at Rainier and the Olympics the balance was much much more leaning towards having a blast of an adventure. We pulled out the tent once again at Cougar Rock Campground, had entertaining and delightful hours at the campfire, and roasted marshmallows over the embers. My daughter danced around the fire singing, I have rarely seen her so relaxed and extroverted. A few minutes later we sat by the fire and tried to recollect all the things we had seen during our trip, she said: “Mum, dad, I am only five years old and already seen so many things!” For the second time in a few days, water rose to my eyes. Now for joy and pride, not for anger. Pure light and bliss in the tidal zone at Kalaloch Beach at the Olympic Coast. Had to think of irishman John Hooton who portraits the mesmerizing coast of Dingle in such fashion from time to time. The final chapter of the story is told quickly: Ten days after the leaving the pacific coast in southern Oregon we reached it again in Olympic National Park. Staying one night at Kalaloch right beside the beach and two days near Forks we had all the opportunity to explore two of the three worlds the Olympics offer, the coast and the rainforest. Hiking in Hoh and Quinault rainforests was a humbling experience and arguably the best sunset of our trip happened at Second Beach near La Push. Totally forgetting about space and time, we spent one of the most inspiring two hours of our lifetime at this magic place. I brought my tripod and snapped a few photos with my father-in-laws camera both at Kalaloch and Second Beach, but quickly refrained and had fun with the family. It’s been as far away from home as three of five of us have ever been (me and my wife have been to Tofino, Vancouver Island, which is a few miles further west) and a perfect culmination of three weeks of new horizons in the Pacific Northwest. They did not only provide the backdrop for adventures, but opened up new horizons in all of us. For that reason I could have left for another trip as soon as one day after our return to Berlin. Oh, Olympic Coast! I’ll be back.